If you have already done all the cliché weekend getaways near you, Fort Kochi is a beautiful place to explore all through the year, and especially in the winter months. This alluring city with a beautiful history makes for a perfect trip with friends or family. Just an hour’s drive from Kochi Airport, Fort Kochi is a water-bound region also called Old Kochi. Kochi has historically managed to mesmerise the Portuguese, Dutch and the British who made it their port of call and subsequently their home. This resulted in a city which is home to an amalgamation of a multitude of cultures. All of this set on the Malabar coast gives you the perfect reason to pack your bags and plan a 3 day holiday to Kochi. Whether you are on a solo trip or a family reunion, Fort Cochin has great things to offer. Discover marvellous architecture, splendid beaches, shopping streets, picturesque falls and mouth-watering street food in its most authentic form. Known as the crown jewel of God’s Own Country Kerala, the city attracts an amazing number of visitors from all around the globe. A delightful place, Kochi boasts a culture that is an amazing mix of the old and the new, promising a memorable vacation with your loved ones at Kochi. If you are planning a 3 or 4 day vacation, and your destination is Fort Kochi, here is an exhaustive list of things to do in the city of cultures. 1. Visit Santa Cruz Basilica: Located on Bastian Street, this church is one of the oldest Catholic Churches in India and one of the eight basilicas in Kerala. Built originally in the gothic style by the Portuguese it is interesting to explore its architectural & artistic grandeur – one of the must-see places for every visitor to the city! 2. Immerse yourself at the Maritime Museum: A good place to get to know the history of the Indian Navy. Antique pistols, Navy warships and aircraft carriers are displayed here. A special section dedicated to post-independence naval victories, which include Junaghad Operation, the Goa Liberation, Indo-Pak Conflicts of 1965 and 1971, Operation Cactus, Operation Pawan and the strategic manoeuvres during Kargil War. If you are on a solo trip and are a history junkie, then this place is perfect to explore in leisure. 3. Pit stop at Dal Roti: Heavy duty sight-seeing calls for a cooling drink & some great food and that’s exactly what Dal Roti provides. Situated on Lily Street at Fort Kochi, this place is famous for its Lime Soda, Rolls, Chicken Mughlai Paratha, Masala Paneer, Butter Chicken & Chicken Thali. The staff is courteous and you can binge on some of the best north Indian fare you can find this side of the country. 4. 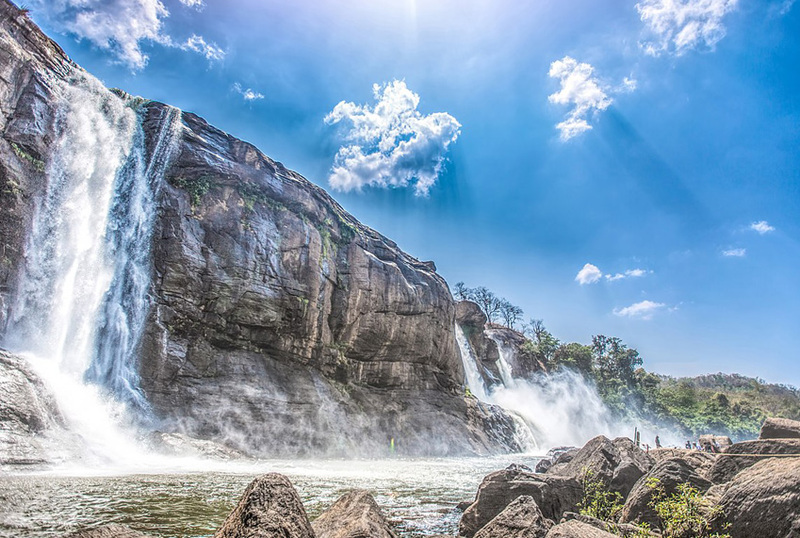 Get drenched at the Athirappilly Falls: Also known as the Bahubali falls, it is the largest waterfall in Kerala standing tall at 80 feet. About an hour and a half from Fort Kochi, this is a great place to chill out with friends. The walkaway towards Athirapally waterfall after crossing the bamboo entrance gate is very well maintained, with a scenic combination of flora and fauna. Though it gets slippery at times, the reward is completely worth the struggle to get to the place! With the waterfall drenching all its visitors, you can quite literally “immerse yourself in nature” here! 5. Chill at Mocha art café: Art and food come together seamlessly at this 300-year-old warehouse beautifully reconstructed into a café. Long Dutch style windows, red oxide floors and the wooden carved pillars lend a rustic charm to this place. This, with an impressive vertical garden and charming light fittings make this place a must visit for any traveller in this city. Hang out & sample some authentic Kerala cuisine if you are on a trip with friends or simply find a quiet spot by the large Dutch windows & read a book if you are on a solo trip. 6. Explore the St Francis Church: St. Francis Church in Fort Kochi, originally built in 1503, is popularly known as the first church Europeans built in India and has great historical significance. Interestingly, it has served as a Roman Catholic church, a Dutch Reformist church & an Anglican church depending on the European nation in power at each given time! 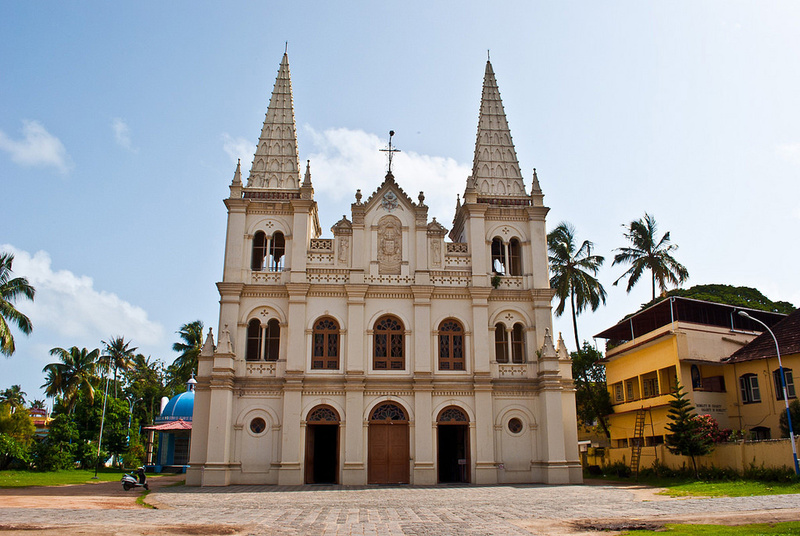 The Portuguese explorer Vasco Da Gama was first interred here after his death in Kochi in 1524, making the church a mecca for travel buffs across the world. 7. Enjoy Ferry rides & catch a glimpse of the Chinese Fishing nets: Legend has it that a famous Chinese explorer introduced the Chinese Fishing Nets to the fishermen in Kochi over 500 years ago. This has evolved into a staple method of fishing in these parts over the years. 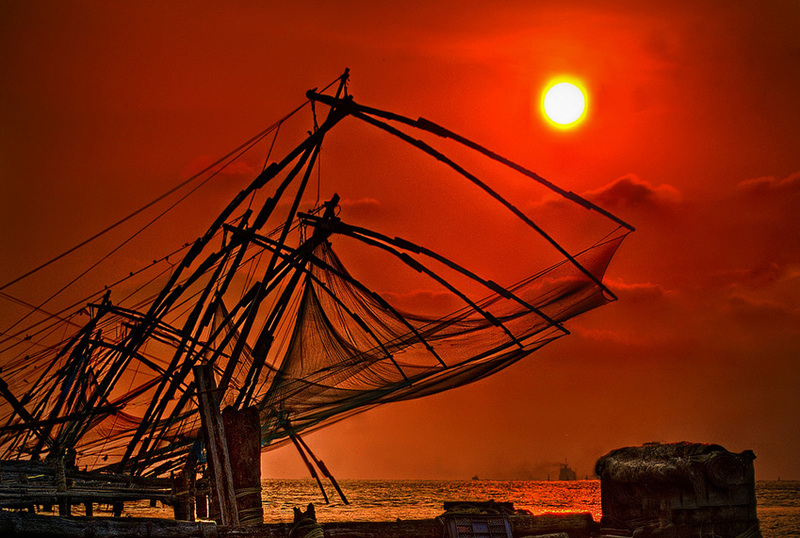 The Chinese fishing nets, or Cheenvala for the locals, have attracted visitors in the Fort Kochi area for centuries. Vasco da Gama Square, a 2-min walk from Hotel Forte Kochi, is the best spot to get the perfect view of these massive structures. From here you can also rent fishing boats or ferries by the hour and travel across to Fort Vypin and visit the culturally significant Lady of Hope Church or watch the sunset at Cherai Beach. 8. Discover the Dutch palace: Also called Mattancherry Palace, this palace was built by the Portuguese in 1555 as a gift to the Kochin Raja. It is built in traditional Kerala Nalukettu style with a central courtyard. The rooms & bedchambers inside are adorned with stunning Kerala Murals depicting Hindu temple art and the palace also plays host to some beautiful portraits of Kochin Rajas executed in a western style. After visiting this museum of beautiful art & architecture, you can wander around the spice markets just outside and imagine how this old town would have once functioned as a centre for business and cultural exchange between various European and Indian communities. 9. Be mesmerised by the Jewish Synagogue: The Malabar Yehudans or the Cochin Jewish community built this synagogue in 1568. The Jews of Fort Kochi fled their homeland, Israel and the diaspora embraced Fort Kochi as their second home. The Synagogue lies adjacent to the Mattanchey Palace and houses many rare antiques and artefacts. Its architecture is sure to leave you in awe. 10. 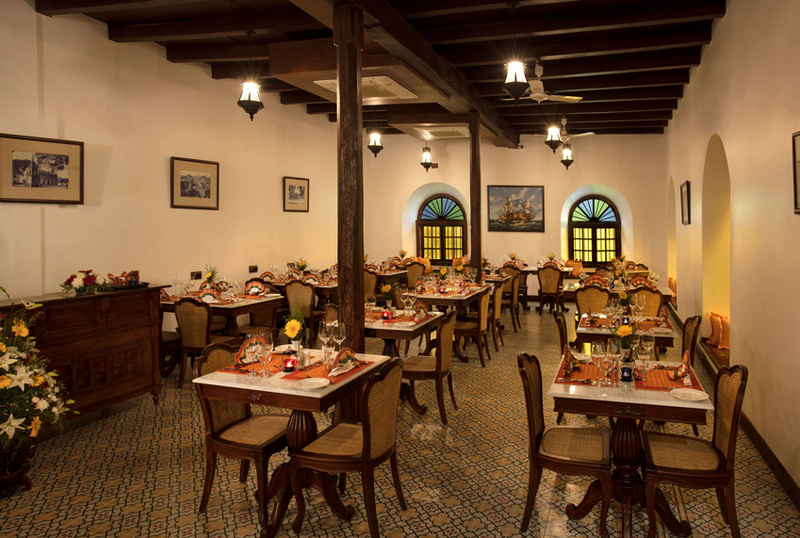 Gorge at Jetty: Jetty is the signature restaurant at Forte Kochi, an old Jewish family home converted to a Heritage hotel. 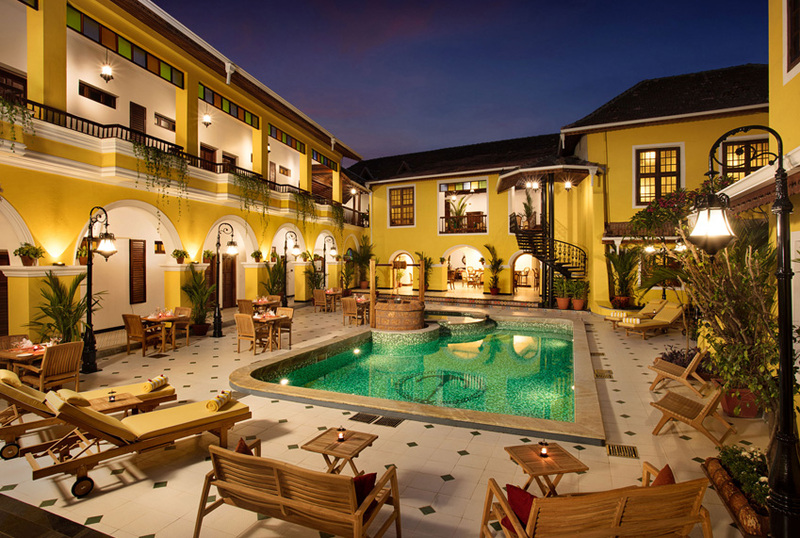 It is located in the heart of Fort Kochi and is the perfect combination of luxury and history. You can’t miss the traditional mouth-watering delicacies served at Jetty and the innumerable photo ops the property’s signature yellow walls provide. Chaayam Kadiyam (the Kerala style Tea Shop) at Jetty serves Thattu Chaya and South Indian Filter Coffee along with some ever-favourite local snacks like Achappam, Kozhalappam, Cookies, Teacake, Pazham Pori, Mysore Bonda, Mulaka Bhajji and many more. 11. 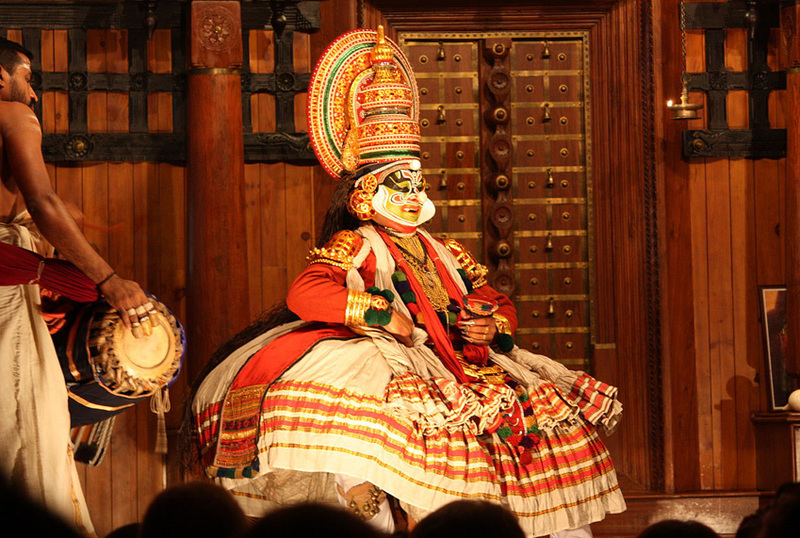 Soak up some tradition at Kerala Kathakali centre: No trip to Kerala is complete without watching a performance of Kathakali, a traditional dance form from the 17th century. Situated on KB Jacob road near Fort Kochi, this place is a traditional arts centre showing kathakali dance performances, Kalaripayattu, as well as other forms of classical dance and music which have been broadcasted on BBC, Discovery and National Geographic. Explore various shows here to soak up some tradition & art. 12. Eat at Fusion Bay: This unassuming little family restaurant in central Fort Cochin is renowned locally for its Kerala Syrian fish delicacies cooked in the pollichathu style (masala spiced and grilled in a banana leaf), and assorted seafood dishes such as spicy fish pappas and fish in mango curry. A foodie’s ultimate delight! 13. 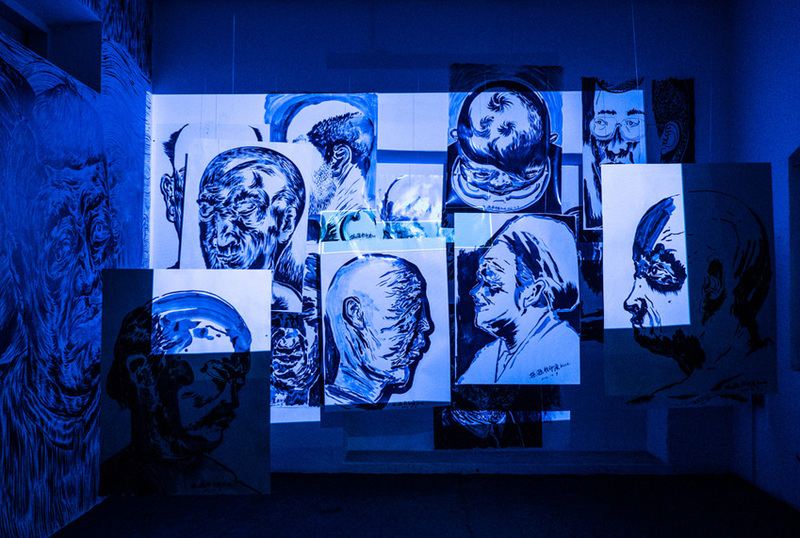 Check out the Kochi-Muziris Biennale: 2018 heralds the fourth edition of Asia’s Largest Contemporary Art Festival, the Kochi Biennale! Featuring 90 artists from around the world, the festival will bring with it an eclectic fusion of culture, art and history – true to the city’s roots, and will completely transform the very streets of Fort Kochi from Dec 2018 to March 2019. A sight to see and an experience to… experience! 14. Uru Art Harbour: This is an old warehouse that has received a facelift and has been transformed into a Cultural Hub that hosts and produces publications, exhibitions, talks, residencies, screenings, performances, design interventions, workshops and educational initiatives. Most interestingly this building is a part of a still functioning dock. Located in Kochangadi, Mattancherry, Uru is one of the venues where the Biennale is hosted as well. 15. Stroll down Princess Street: The most famous shopping street in Kochi is situated just outside Forte Kochi! This street has European style homes, vibrant avenues and a long stretch of shops selling handicrafts, clothes, jewellery and everything under the sun. There are also many spas and Ayurveda centres you can get relaxing massages at. Indulge in some tasty food and beverages from the numerous cafes and restaurants dotting the street (including our own!). All this sounds exciting if you have a good 3 or 4 days to spend in Fort Kochi. But if you are there for a quick 2 day trip to Fort Kochi, worry not, here is how you should plan your trip. Day 1: Plan your stay in a hotel in the heart of Fort Kochi, so that most attractions would be nearby. Start your day with a visit to Santa Cruz Basilica and the Dutch Palace. Cover the Kerala Kathakali centre and in the evening, you can take a ferry ride and stroll along the beach to see the Chinese fishing nets. Enjoy your dinner at Jetty in Hotel Forte Kochi. Day 2: With an early morning start, you can visit the Athirapally falls. Don’t miss out on the Maritime Museum and unwind at the Mocha Art Café on your way back. End your weekend getaway with a drive down Marine Drive and enjoy the local fare at Fusion Bay. Fort Kochi offers something for every kind of traveller, whether you are interested in art, music, architecture, history, food or simply a relaxing weekend at a luxury boutique hotel like Forte Kochi. Hotel Forte Kochi offers decadent living with a mix of Dutch, Portuguese and British architecture coupled with delicious pan-European, Indian and Kerala food from the in-house restaurant– a true microcosm of the city in itself! Centrally located on Princess Street, many of the city’s attractions are actually within walking distance, making it a perfect location to stay while exploring the city. Visit us, and #Be Charmed By The Past. Follow us on Facebook and see our resort in all its glory on Instagram. Check out our website-only offers here and book your stay with us now!